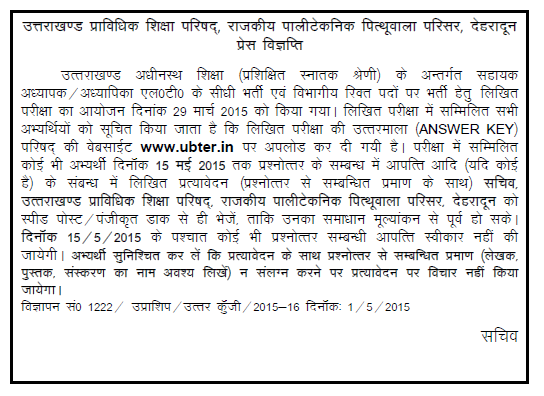 Uttarakhand Board of Technical Education, Roorkee (UBTER) had conducted a written test for the posts of Licentiate Teacher (LT) / Assistant Teacher on 29 March 2015. Earlier the board had invited applications for these 3093 posts. Many number of candidates had applied for these posts. Now the latest news is that LT results had been declared by UBTER. Candidates can check UBTER LT Exam result from the direct link given below after declaration. Result date: UBTER had declared LT/Assistant teacher results on 30.01.2016. UBTER LT written test was held on 29 March 2015. Now the results had been announced. Candidates can also check marks and document verification notice of UBTER LT exam from above link. The written exam was an objective type test. It has two parts of 100 marks each. In Part-I (100 marks), questions had been asked from Teaching skills, Reasoning Aptitude & General Knowledge. Part-II (100 marks) have questions from the subject chosen by candidate. Time allowed was 2 Hours. UBTER will upload the results at ubter.in after preparation. Candidates can check them easily by clicking on above links. In order to check the result for UBTER Assistant Teacher (LT) exam, candidates need to visit the direct link provided here. After the declaration of UBTER LT results, a direct link to check them will be posted here. You can find you marks / qualifying status from there by entering your roll no. or by downloading pdf. 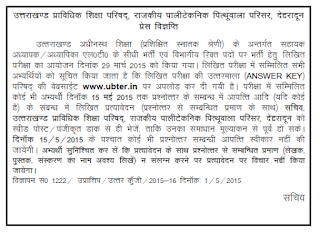 UBTER LT result 2015 will be notified on this page and all the latest news regarding this.